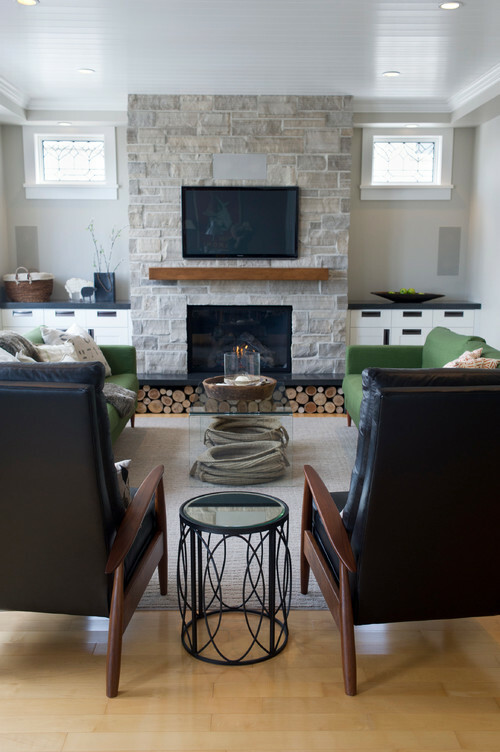 Creating a family room that could stand up to two young boys was "pretty easy" here, says interior designer Sophia Reay -- these clients are very down-to-earth, laid-back and fuss free. Bringing architectural interest and natural elements into the room was the bigger issue. "This is a subdivision home that didn't have much interior architectural value," Reay says. 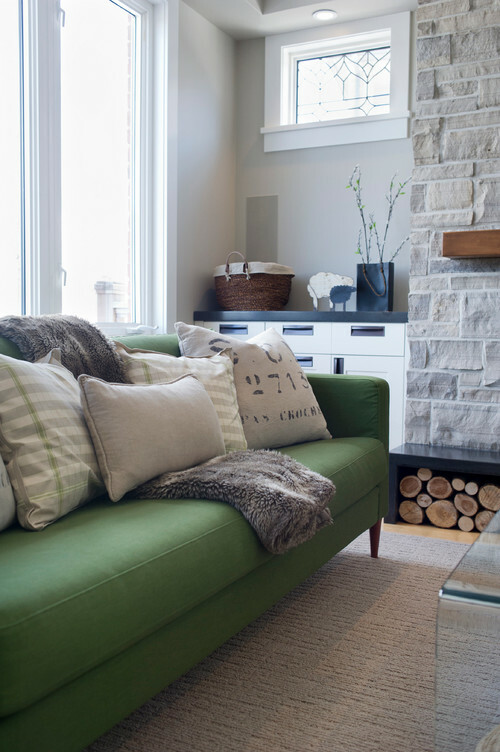 She remedied that by adding a fireplace, cabinets, windows, millwork, layers of texture and comfy seating. Here's how she turned a blank slate into a comfortable family gathering spot. The clients' style is "traditional with a funky edge," says Reay, of LemonTree & Co. Interiors. They love midcentury modern pieces, and Reay wanted to create an organic feeling with the textures of nature. The house sits next to a large wooded area, and Reay brought in some of its feeling. "I don't think people can connect with a room without connecting the room to nature," she says. A fireplace, built-in cabinetry, baseboards, crown molding, leaded glass windows and a painted wood ceiling give the room the architectural details the owners were after. Reay extended the bulkhead all the way around the room; recessed lights in it illuminate the built-ins. 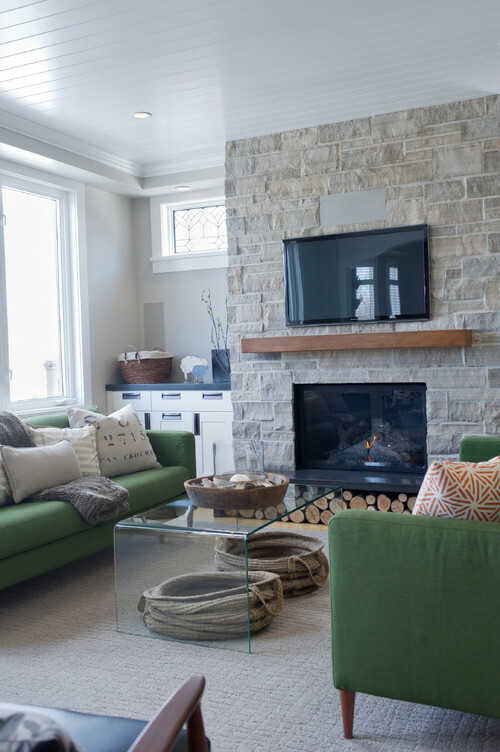 The gas fireplace features a local Bruce Grey ledgerock surround and a long poured concrete hearth. 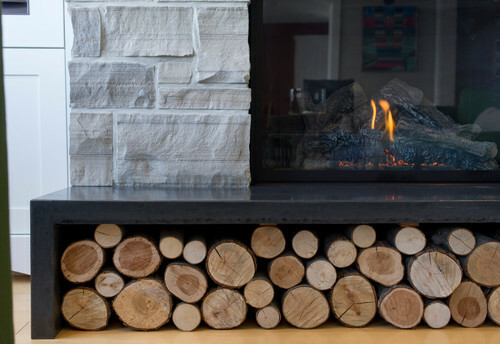 Crisply cut hardwood logs aren't intended for the actual fire; they add a sculptural element and pattern that complement the stone. 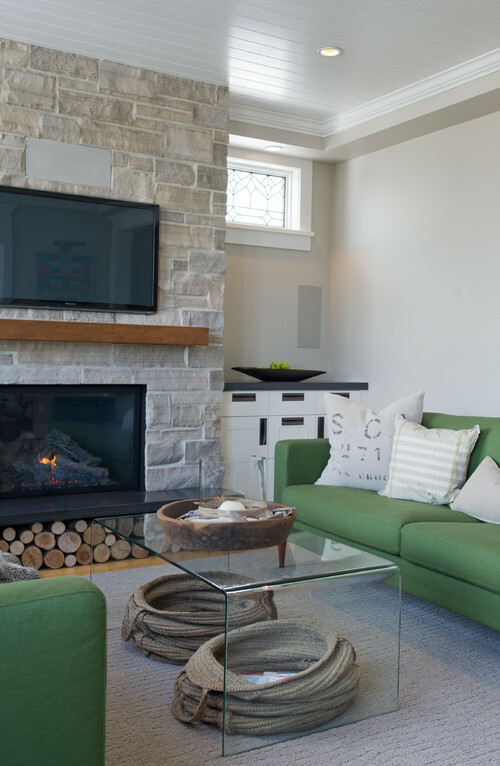 Reay flanked the fireplace with built-ins for media equipment, toys and the owners' books. One of the owners is very much into photography, so his albums are in there; the other loves to make books for each boy representing every year of his life. The cabinets have concrete countertops that match the hearth, and the hardware is oil-rubbed bronze. Washable fabric on the cheery grass-green sofas stands up well to spills. Theglass coffee table keeps the view to the fireplace open, and those burlap laundry sacks underneath help keep the room tidy. Their built-in wiring makes them expandable, so the boys can collect their toys at the end of the day and carry them back to their rooms. Opting for a TV over the fireplace came with challenges. To keep a TV from taking over, Reay recommends that if it isn't concealed, it should not be larger than the fireplace box. "This is a tough challenge with some of my bachelor clients who love giant TVs," she says, laughing. The fireplace dictates the mantel, including how far a wood mantel needs to be from the firebox for safety, and how far it needs to stick out to protect the TV screen from the gas heat. "I hate wires, and I hate speakers," Reay says. The wires were framed in the stud cavities, and the sound system's three speakers blend into the walls and fireplace. 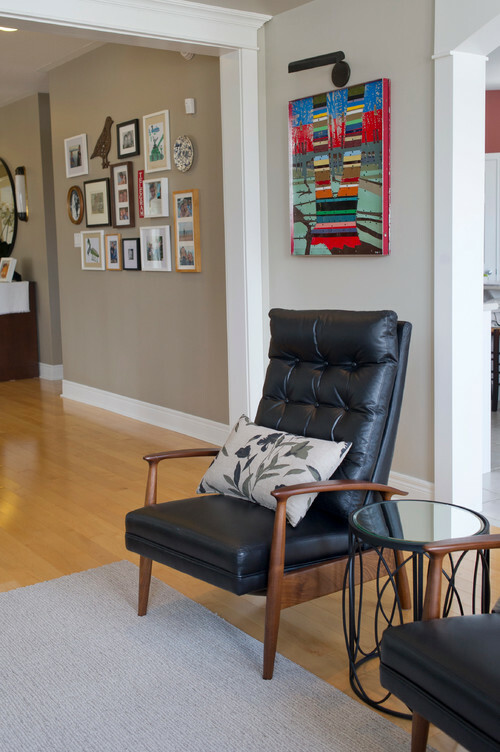 In addition to the room's clean lines and uncluttered feel, these leather reclining chairs nod to the couple's love of midcentury modern style. The chairs are very comfortable without being clunky, and the leather is easy to wipe up in case of spills. Reay has been helping the young family spruce up their home at a rate of about one room per year since 2009. See more of her work on this project.